“Shape Up Your Plate” is the theme for National Nutrition month and we’re on a mission to make eating vegetables taste good. Last week we explored how to use the flavor of salt to make vegetables delicious. This week we’re seeking ways to help those with a love of sweets use their favorite flavor to spruce up vegetables and make them worthy of a second helping. If you’re a person who sees sugarplums dancing in your head, you can pat yourself on the back — you’re a product of successful evolution. (If you’re a reptile, sorry, you’re at the wrong blog.) Milk is the first thing every mammal eats and nature did us a favor by making it sweet and tasty. So while we start with a love of sweets from milk, our bodies continue to seek sweetness for glucose (sugar), our preferred source of energy. Michael Pollan’s book “The Botany of Desire” presents an interesting case for nature’s role in the promotion of sweetness. Pollan suggests that fruiting plants intentionally enclose their seeds in sweet-tasting flesh to lure humans into eating them and consequently transporting and spreading their seeds. The idea makes perfect sense, but thinking of plants being that wily seems amazing. So what the heck are vegetables doing and why don’t they seek our approval as well? As it turns out, vegetables and herbs generally have a bitter taste in an effort to keep us from eating them. Our bodies interpret the bitter taste as a warning not to eat them. Usually a bitter flavor is a sign of a food item that is poisonous. However, in this day and age we know that vegetables are good for us and safe for eating. Begin with fresh vegetables. The fresher the vegetable, the sweeter the taste. Pick seasonal vegetables, start your own garden, visit a local farmer’s market or join a crop share. At the grocery store look for the country of origin sticker and choose the vegetable with the shortest travel distance. Start with sweeter-tasting vegetables like carrots, snap peas, cucumbers, squash and bell peppers. Do a little exploring at your local farmer’s market, explain to the grower what you’re looking for and ask for recommendations. Cook vegetables to increase their sweetness. Cooking helps to break down cell walls and release sweetness. Spruce vegetables with a little extra flavor. Add a touch of honey, maple syrup, fruit or sugar to sweeten your recipe. Add herbs and spices like cinnamon, vanilla, mint and basil. Keep in mind that one step in the right direction is still one step. Eating plain, raw vegetables may be healthy, but let’s be honest — what good does a healthy choice do if it’s never eaten? Try this delightfully sweet Brussels sprouts recipe from Pamela Morgan’s book “Flavors.” (If you just said out loud I don’t like Brussels sprouts, use this recipe to give them a second chance.) The combination of sweetness from the maple syrup combined with the rich flavor of the roasted sprouts is fabulous! To toast the chopped walnuts, place them on a baking sheet in a 350-degree oven for 5-8 minutes. When done, preheat oven to 450 degrees. Combine walnuts, butter and maple syrup in a small bowl and set aside. Place Brussels sprouts on a cookie sheet and top with olive oil, salt and pepper. 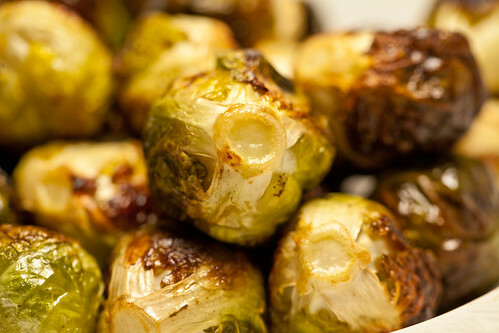 Place Brussels sprouts in the oven and turn them every 5 minutes for about 20-25 minutes. Brussels sprouts are done with they appear golden and feel fork tender. Check back next week as we enter the surprisingly tasty world of bitter. What ways have you found to emphasize sweet flavors in vegetables? I only just learned that I happen to love brussels sprouts this past holiday season – who knew that they taste SO good and are even better for you?! I just posted a recipe on my blog for adding these little treasures to omelets for an excellent flavor and zip of vitamins/iron! Hi Nicole, I totally agree, brussels sprouts are a great find! I’ll have to check out your recipe too. Great ideas! I can’t wait to try these out this summer! Thanks for reading Jackie, I hope you enjoy the recipe.